We can bring you the matches with the most potential for a happy and long-lasting relationship, we rely on findings from 40 years of research in this field: The Parship principle® analyzes 32 personality traits and is based on a matching algorithm of 136 rules. Sounds complicated. Mathematical. Psychological. But it is very simple: gayParship searches - you find! 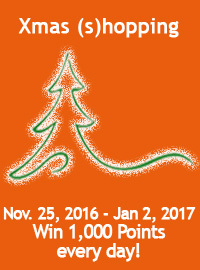 Points credit may take up to 60 days.